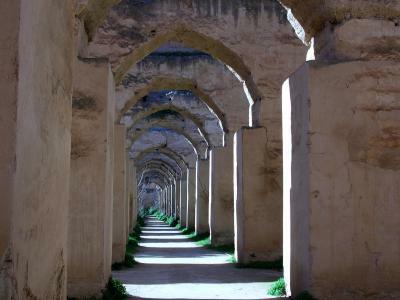 Meknes is a city in northern Morocco, between Rabat and Fes. It was once the capital of Morocco before it was reassigned to Marrakech. Meknes is named after a Berber tribe (Miknasa). This city located by the Atlas Mountains has cool winters and hot summers. The Dar El Makhzen palace here contains a 2 kilometer long corridor formed by 2 large walls. It was once Moulay Ismaïl's palace. The Bab Mansour gate was named after the architect who built it in 1732. Almohad patterns decorate the gate. There are also mosaic Zelij tiles of superb quality on the gate. 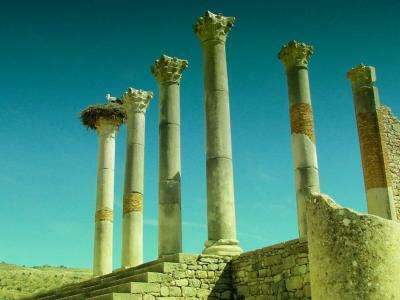 Marble columns were take from the Roman ruins of Volubilis. 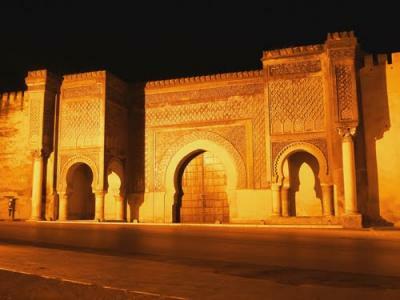 It is believed that when the gate was completed, Moulay asked the architect El-Masur if he could do better. El-Masur was compelled to say yes, which drove the sultan mad and gave order to have him executed. Other decorated gates in the area include Bab Lakhmi and Bab Berdaïne, both from the 17th century. Dar El Beida is a 19th-century palace built by sultan Mohammed ben Abdallah. The Royal Military Academy current resides here. 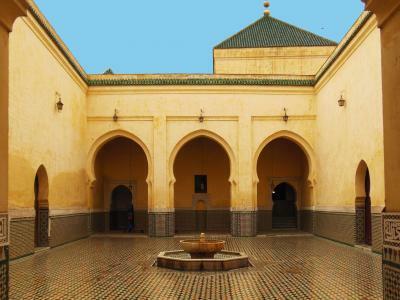 Other attractinons in Meknes include the Mausoleum of Moulay Ismail, which was built in 1703, the Lahboul gardens, and the Grand Mosque. The Koubat Al Khayatin was where the sultan received foreign ambassadors.